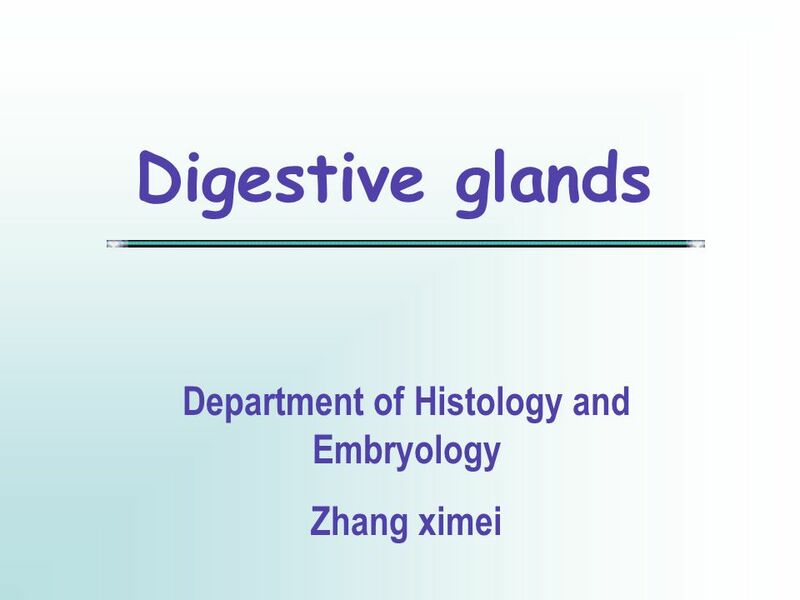 Digestive glands Department of Histology and Embryology Zhang ximei. 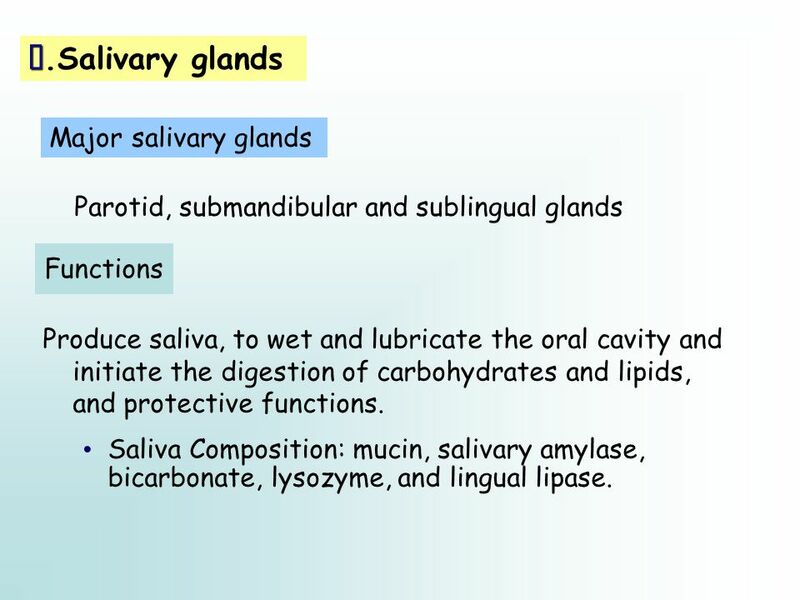 3 Ⅰ Ⅰ.Salivary glands Major salivary glands Parotid, submandibular and sublingual glands Functions Produce saliva, to wet and lubricate the oral cavity and initiate the digestion of carbohydrates and lipids, and protective functions. Saliva Composition: mucin, salivary amylase, bicarbonate, lysozyme, and lingual lipase. 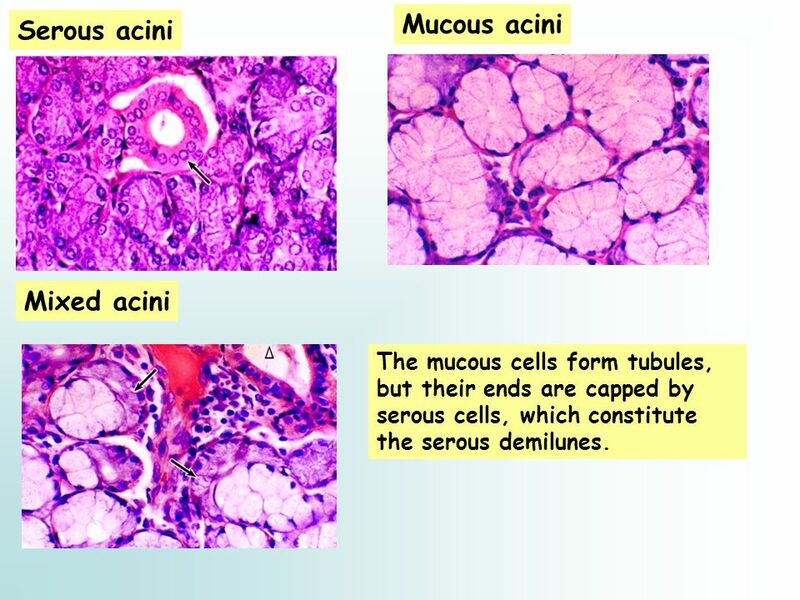 5 Serous acini Mucous acini Mixed acini The mucous cells form tubules, but their ends are capped by serous cells, which constitute the serous demilunes. 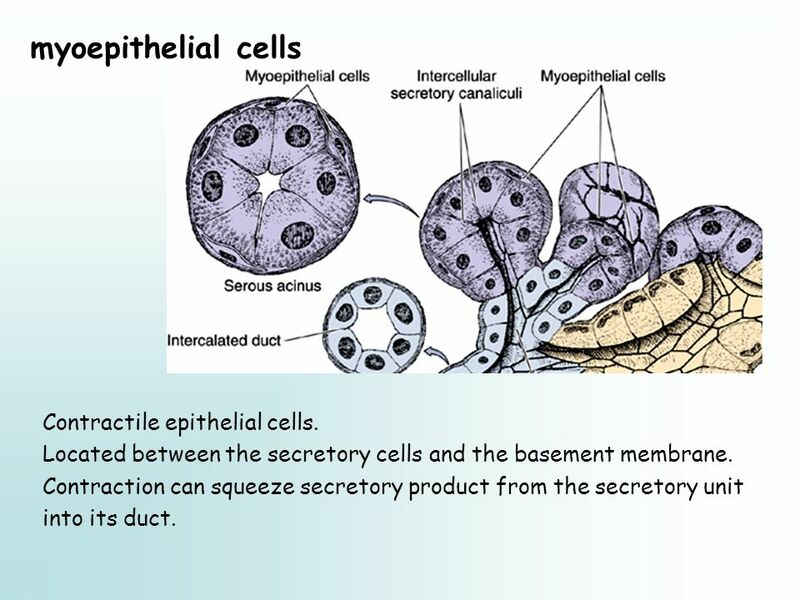 6 myoepithelial cells Contractile epithelial cells. 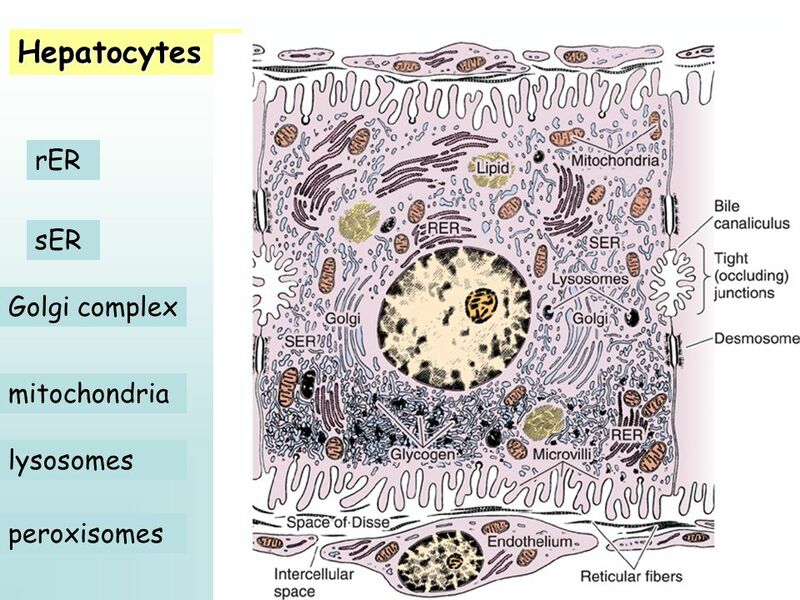 Located between the secretory cells and the basement membrane. Contraction can squeeze secretory product from the secretory unit into its duct. 7 Type-specific structure Sublingual gland Parotid gland Submandibular gland Contain only serous acini. Serous acini are numerous. Are composed almost of mucous acini and mixed acini. 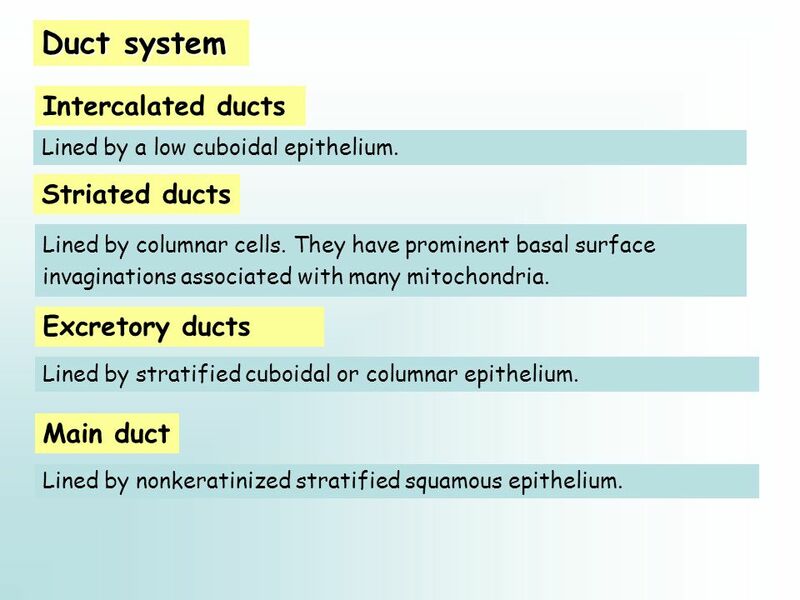 8 Duct system Intercalated ducts Striated ducts Excretory ducts Lined by a low cuboidal epithelium. Lined by columnar cells. They have prominent basal surface invaginations associated with many mitochondria. Lined by stratified cuboidal or columnar epithelium. 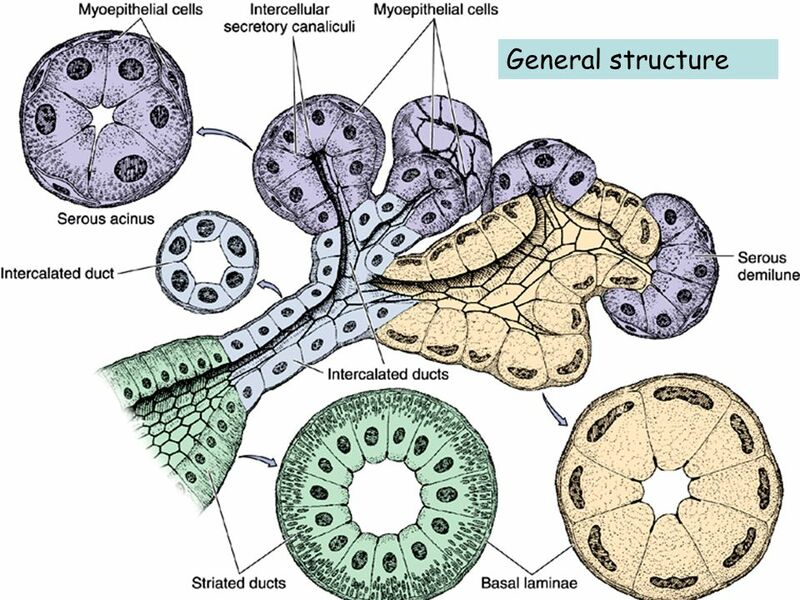 Main duct Lined by nonkeratinized stratified squamous epithelium. 9 II. Structure of pancreas Basic anatomy The pancreas is an elongated gland described as having a head, body, and tail. The pancreatic duct extends through the length of gland and empties into the duodenum. 10 A completely serous gland. 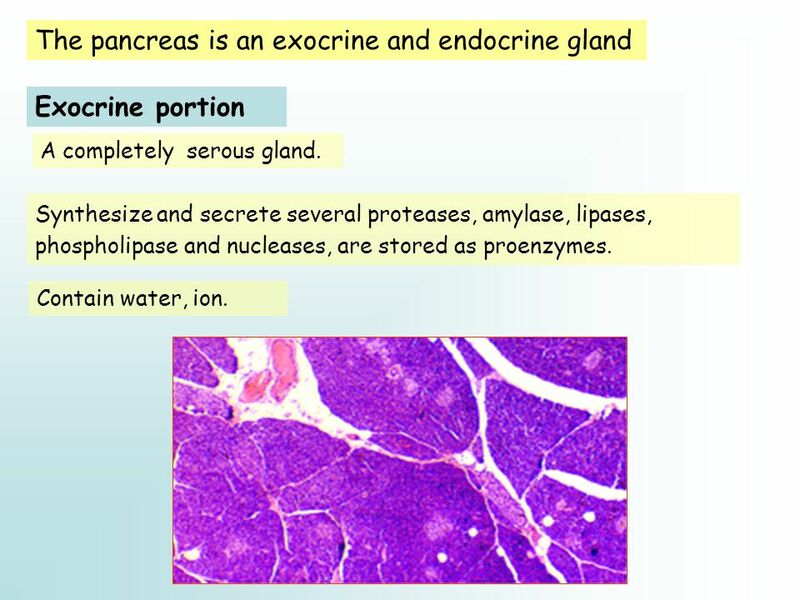 Exocrine portion The pancreas is an exocrine and endocrine gland Synthesize and secrete several proteases, amylase, lipases, phospholipase and nucleases, are stored as proenzymes. Contain water, ion. 11 The cells are pyramidal. 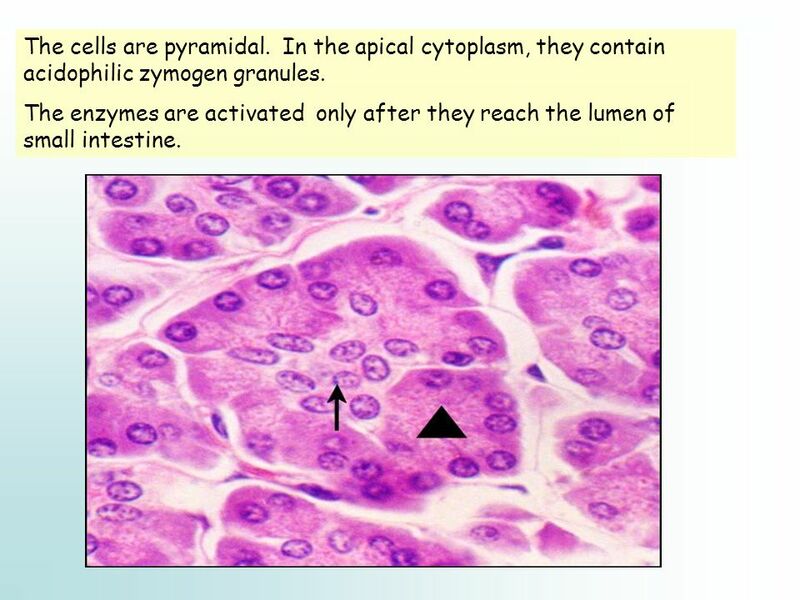 In the apical cytoplasm, they contain acidophilic zymogen granules. The enzymes are activated only after they reach the lumen of small intestine. 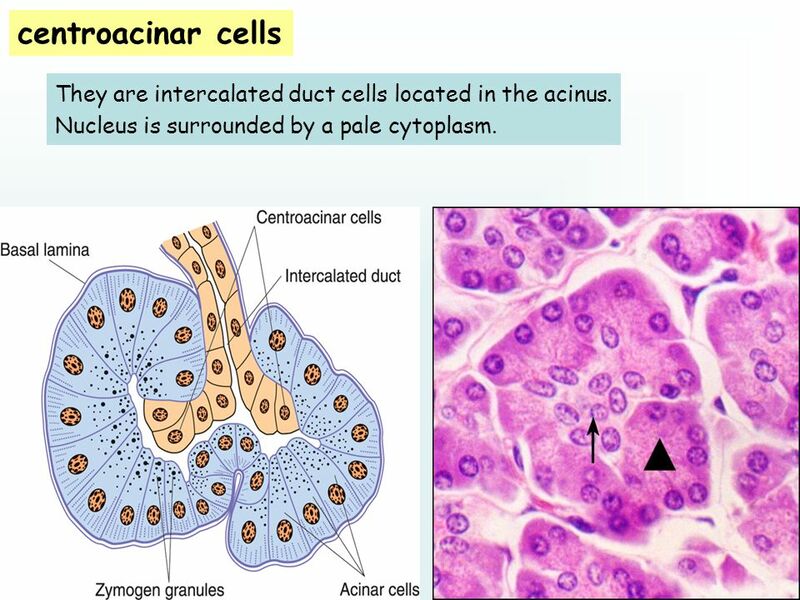 12 centroacinar cells They are intercalated duct cells located in the acinus. Nucleus is surrounded by a pale cytoplasm. 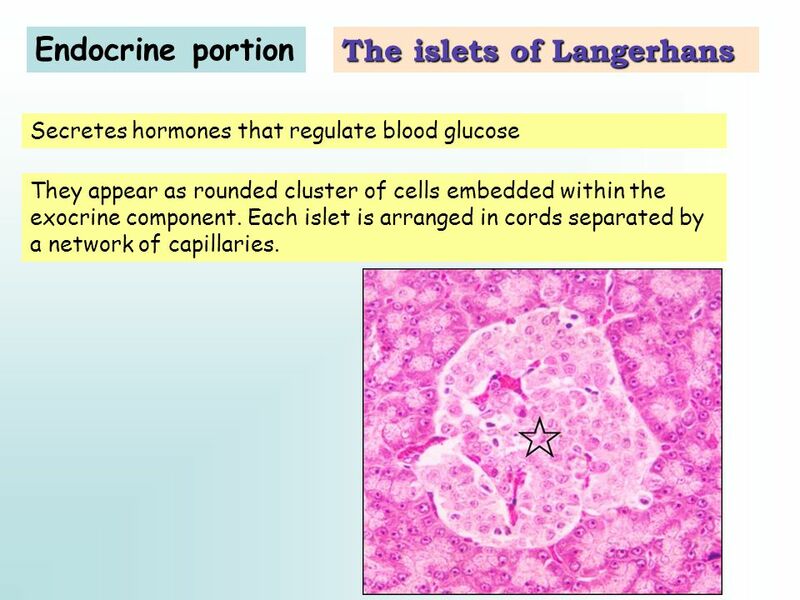 13 Endocrine portion The islets of Langerhans Secretes hormones that regulate blood glucose They appear as rounded cluster of cells embedded within the exocrine component. Each islet is arranged in cords separated by a network of capillaries. 14 A cellB cellD cell PP-Pancreatic polypeptide, stimulates gastric chief cells, inhibits bile secretion and pancreatic secretion. D-Somatostatin, inhibits insulin and glucagon secretion. B-Insulin, decreases blood glucose levels. 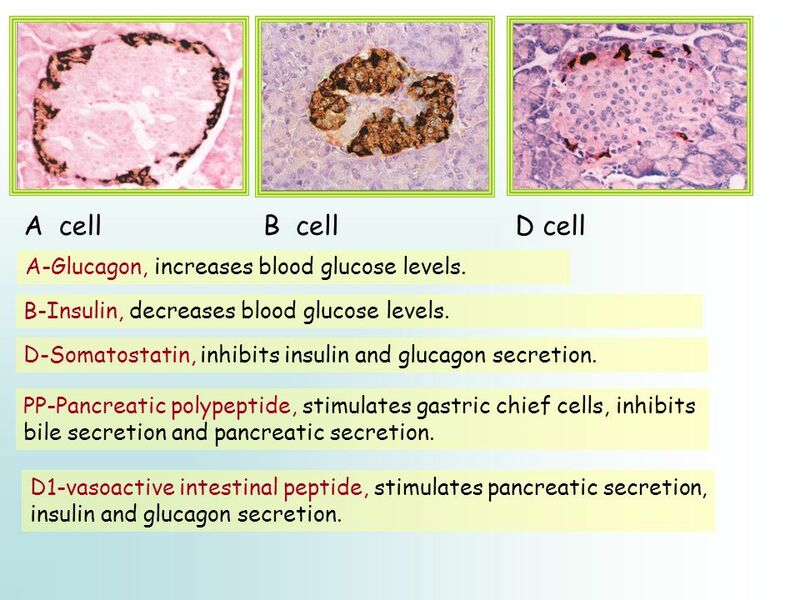 A-Glucagon, increases blood glucose levels. D1-vasoactive intestinal peptide, stimulates pancreatic secretion, insulin and glucagon secretion. 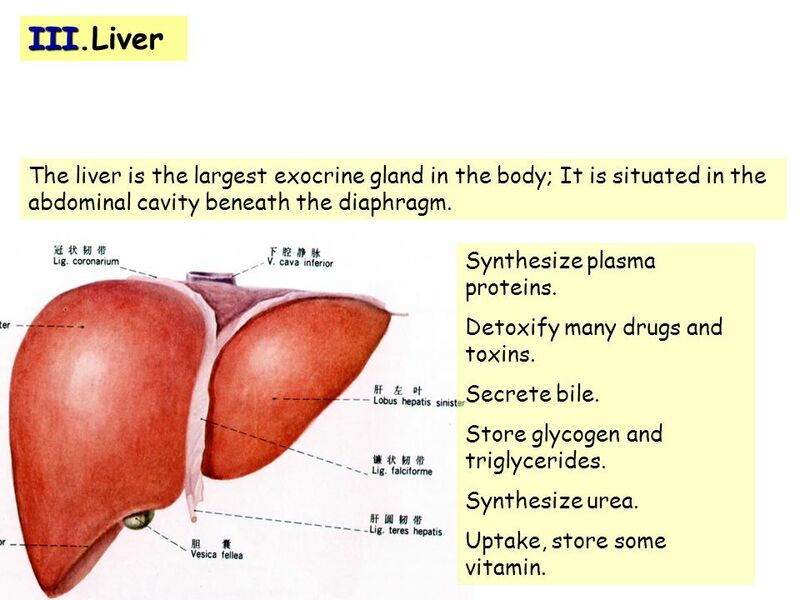 15 III III.Liver The liver is the largest exocrine gland in the body; It is situated in the abdominal cavity beneath the diaphragm. Synthesize plasma proteins. Detoxify many drugs and toxins. Secrete bile. Store glycogen and triglycerides. Synthesize urea. Uptake, store some vitamin. 17 Central vein In the center, endothelium form the wall, with few CT, the openings of the hepatic sinusoid lie in the wall. 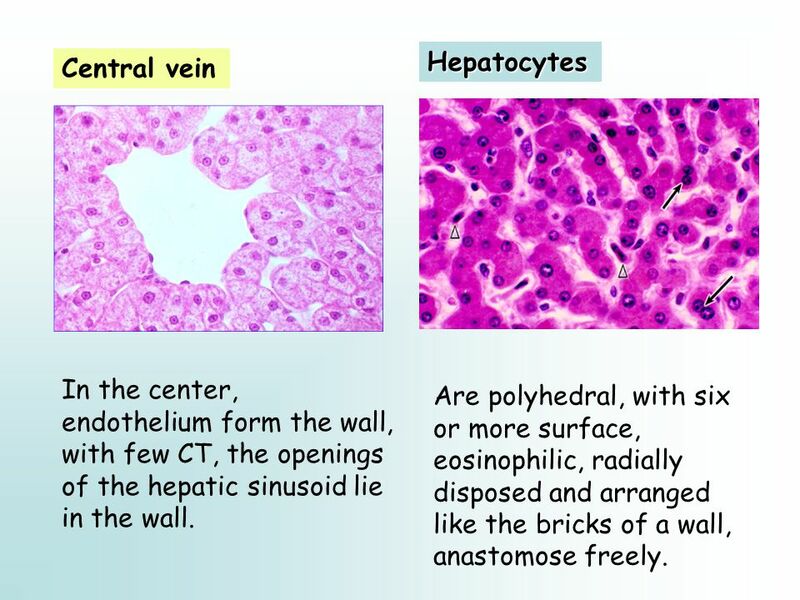 Hepatocytes Are polyhedral, with six or more surface, eosinophilic, radially disposed and arranged like the bricks of a wall, anastomose freely. 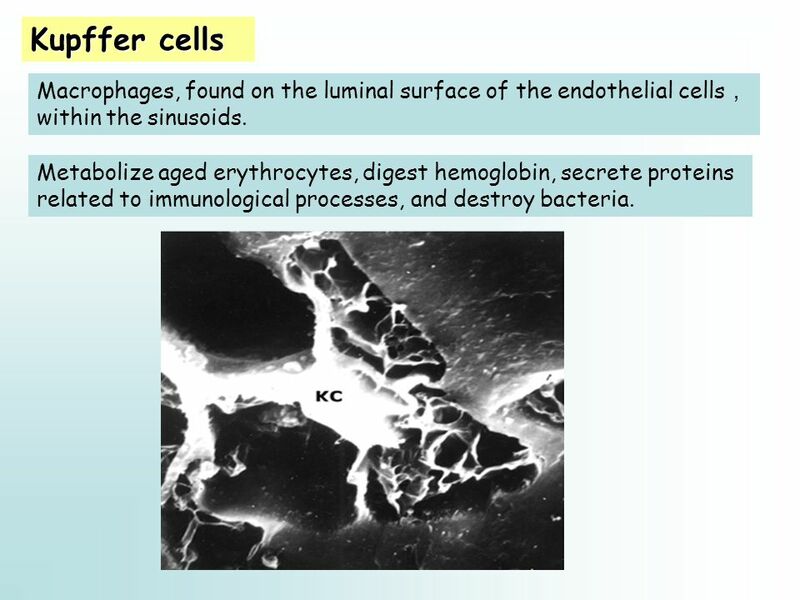 20 Kupffer cells Macrophages, found on the luminal surface of the endothelial cells ， within the sinusoids. Metabolize aged erythrocytes, digest hemoglobin, secrete proteins related to immunological processes, and destroy bacteria. 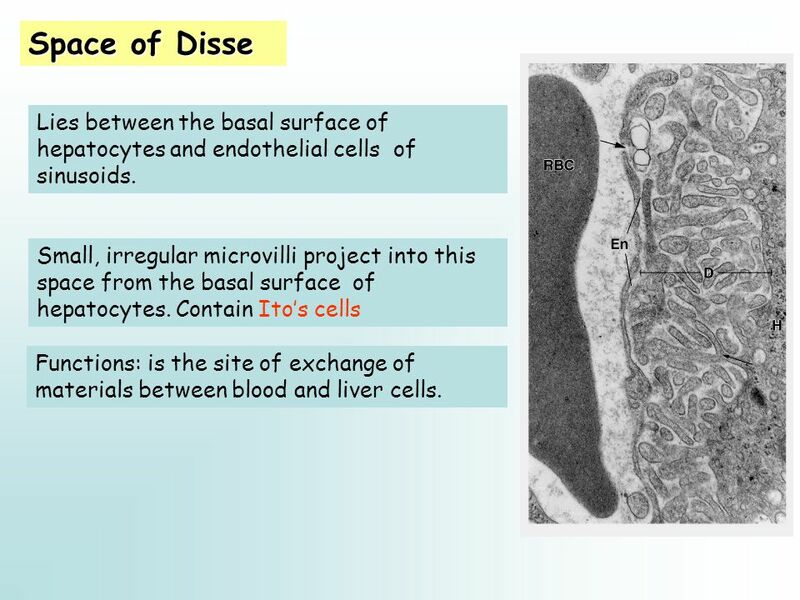 21 Space of Disse Lies between the basal surface of hepatocytes and endothelial cells of sinusoids. Small, irregular microvilli project into this space from the basal surface of hepatocytes. 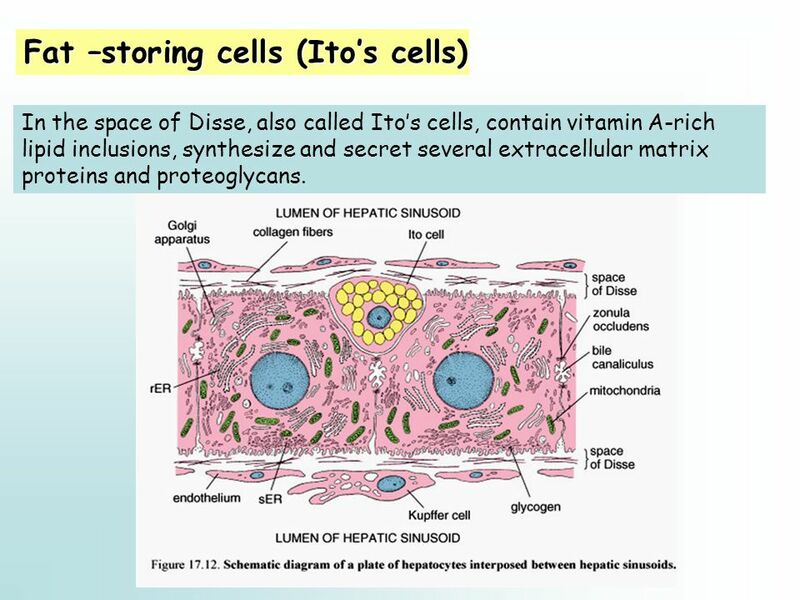 Contain Ito’s cells Functions: is the site of exchange of materials between blood and liver cells. 22 Fat –storing cells (Ito’s cells) In the space of Disse, also called Ito’s cells, contain vitamin A-rich lipid inclusions, synthesize and secret several extracellular matrix proteins and proteoglycans. 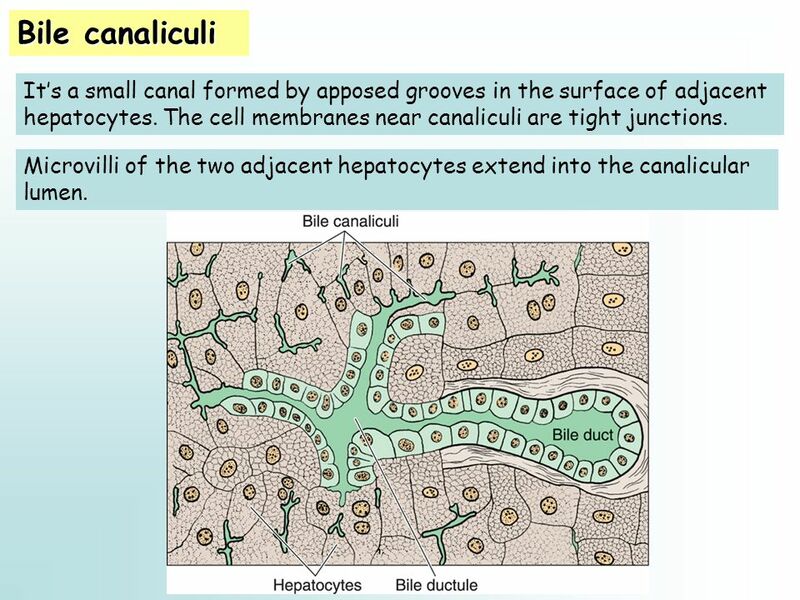 23 Bile canaliculi It’s a small canal formed by apposed grooves in the surface of adjacent hepatocytes. The cell membranes near canaliculi are tight junctions. Microvilli of the two adjacent hepatocytes extend into the canalicular lumen. 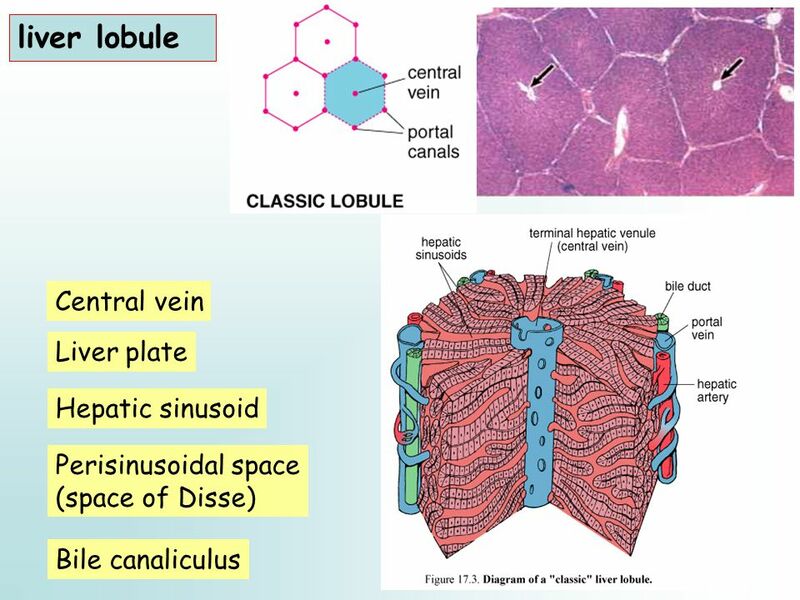 24 Portal space 1 、 interlobular venule: the wall is very thin and their lumen is very large. 2 、 interlobular arteriole: the wall is formed by endothelial cells and smooth muscle cells’ layer. Their lumen is smaller. 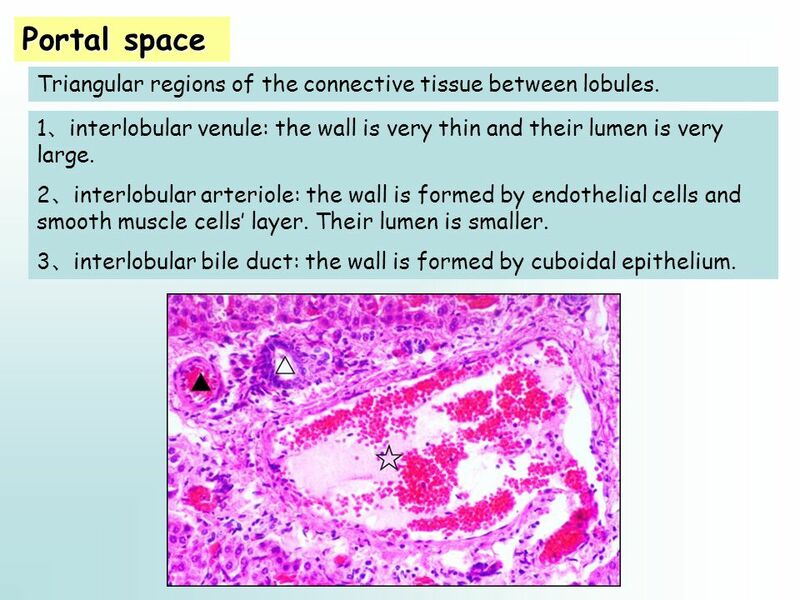 3 、 interlobular bile duct: the wall is formed by cuboidal epithelium. Triangular regions of the connective tissue between lobules. 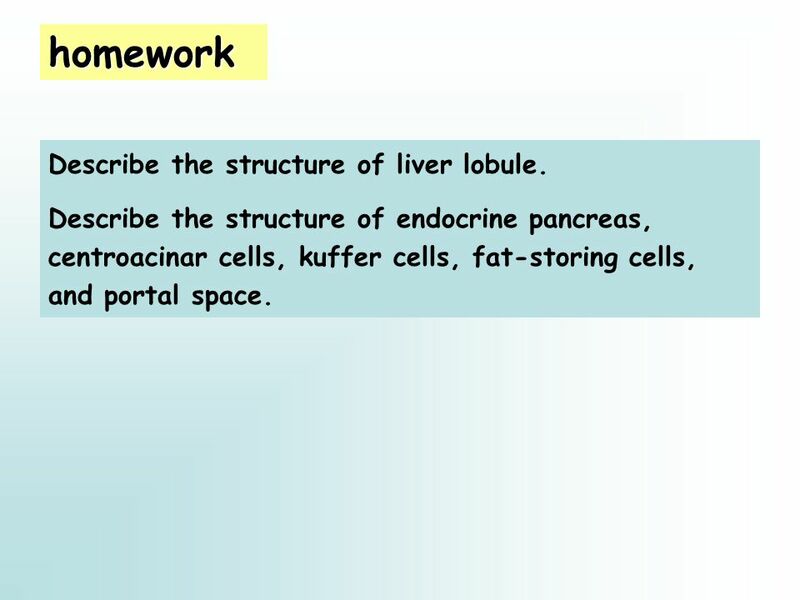 25 homework Describe the structure of liver lobule. Describe the structure of endocrine pancreas, centroacinar cells, kuffer cells, fat-storing cells, and portal space. Download ppt "Digestive glands Department of Histology and Embryology Zhang ximei." In the name of God Digestive gland Dr. Zahiri. The Digestive System. 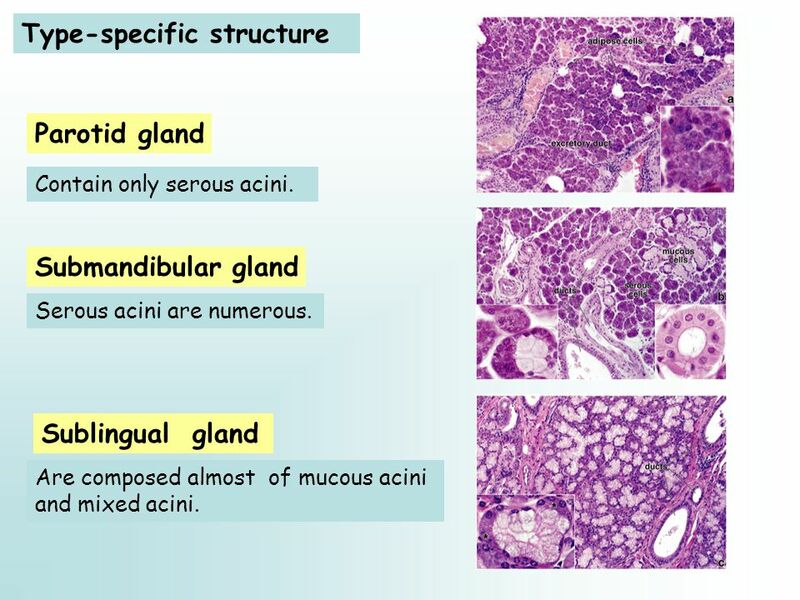 Exocrine gland---with duct Constituents of multicellular gland: secretory portion: tubular,acinar or tubuloacinar gland duct: passage. 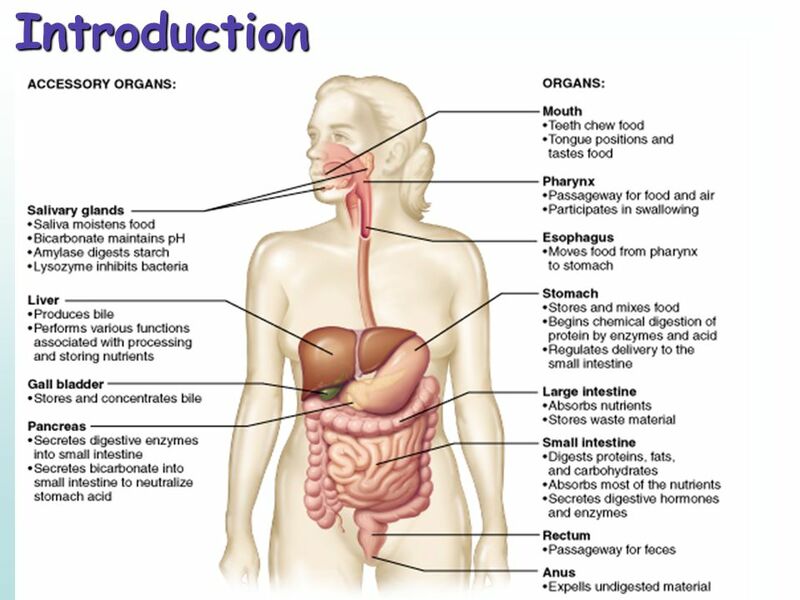 DIGESTIVE SYSTEM III continued. 5. The liver cells or hepatocytes are arranged in an interconnecting network of plates that are one or two cells thick. 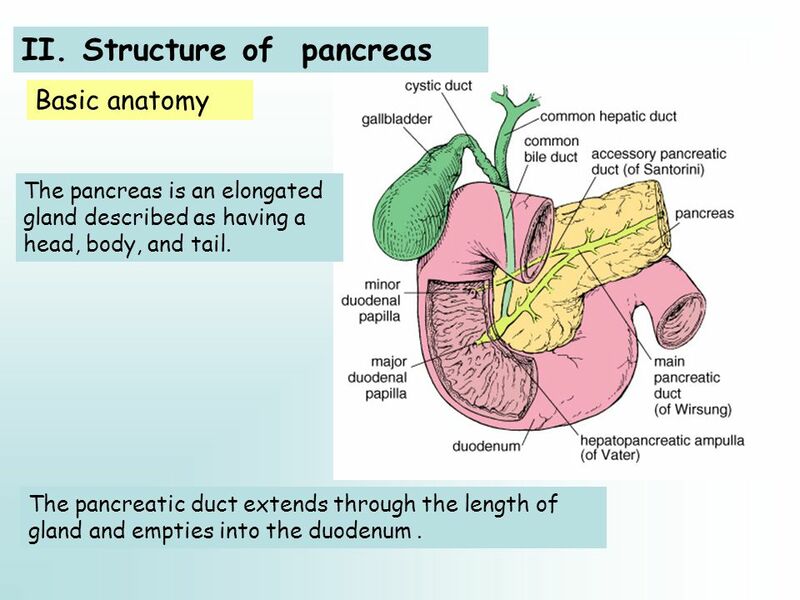 PANCREAS Objectives The student should be able to describe: 1.The endocrine part of the pancreas within the exocrine part. 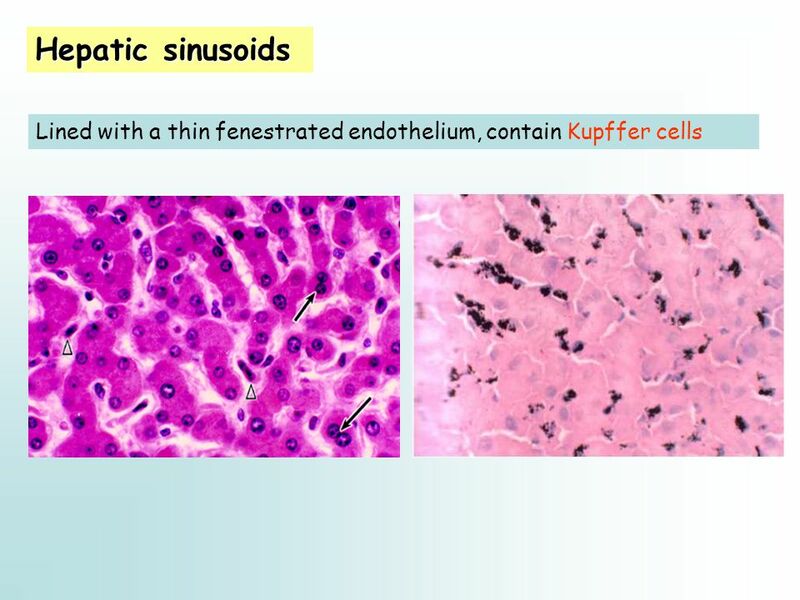 2.The histological features. Copyright 2007 by Saunders/Elsevier. All rights reserved. Chapter 18: Digestive System: Glands Color Textbook of Histology, 3rd ed. Gartner & Hiatt Copyright. Pancreatic secretions The pancreas acts as an exocrine gland by producing pancreatic juice which empties into the small intestine via a duct. The pancreas. Pancreas, Liver, and gallbladder Metallic 0 Mind. LIVER& GALLBLADDER Dr Iram Tassaduq. LIVER& GALLBLADDER Dr Iram Tassaduq. Digestive glands. General outline  small digestive glands distributed in the wall of digestive tract esophageal glands, gastric glands and intestine. Chapter 24 6 – The Pancreas, Liver & Gallbladder. Digestive gland Dr. Maria Zahiri.